Toole committed suicide at the age of 32, leaving behind two unpublished novels and an impressively determined mother who succeeded – after much badgering – in gaining the novelist Walker Percy’s interest and support in the manuscript of A Confederacy of Dunces. Cover of A Confederacy of Dunces. Published posthumously, the novel garnered instant and great acclaim and has been continuously in print ever since and translated into numerous languages. While The Neon Bible was in fact written before A Confederacy of Dunces, it only came to light during the successful reception of the later novel, and its publication was delayed by some years because of legal wrangling involving Toole’s mother, the publishers and the courts. Nonetheless, the novel is an astonishing achievement, not least because it was written, it seems, when Toole was barely a teenager. It will arguably become regarded as a classic of contemporary American fiction, and a classic of Bildungsroman literature. It is a haunting and poetic evocation of a boy’s loss of innocence in the rural America of the 1930s and 40s. There are echoes of Mark Twain, John Cheever, J. D. Salinger and S. E. Hinton, to name but a few and, impressively, the ‘voice’ and identity of the central character, the young boy, Dave, are as distinct and compelling as any by those others. In a series of linking memories we learn about Dave and his painful trials and tribulations growing up. His mother becomes emotionally unstable when her husband returns in a coffin, from fighting in Europe during the second world war; his Aunt Mae, an eccentric, once-travelling singer, and Dave’s only real friend and companion, discards him for the sake of her infatuation with a 70-year-old fiddle-playing boyfriend and the temptations of Nashville; and his local preacher inflicts a destructive hypocrisy upon him (in fact, it is this preacher’s church that displays the tacky, monolithic, ‘neon bible’). As if these weren’t enough, yet more troubles ensue, accumulating to the point that he is compelled to escape to the city, leaving innocence in his wake, and only the memory of bitter experience for reflection. Juxtaposed, Toole’s two novels differ in style, language and humour – understandably, as he was just 13 or so when he wrote The Neon Bible, whereas he wrote A Confederacy of Dunces as an adult. 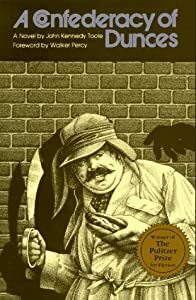 In the latter novel, we have the fantastic figure of Ignatius J. Reilly, towering, Rabelaisain and Falstaff-like, battling against the dim-witted and the short-sighted in his quest for truth, beauty, and a bountiful supply of hot dogs, his favourite food. Its language is rich and boisterous, its style sweeping in its intensity. In The Neon Bible, Dave is the centre, holding the novel together with his rural speech; his gentle, graceful and easy language complementing the impression we have of him and his world. Even so, their lives and their principles are, arguably, the same: both value Platonic ideals above all else; both are outsiders, most often alone – feeling the loss of their innocence – and reflect a pervading sadness that is at the very heart of their lives. There is no question that the publication of this, his only other fiction, underlines the awful tragedy of Toole’s death.